The AWR4000 treats 90,000 gallons of water/day. This purifier comes with a FREE 3 stage NASA based filtration system. Today, copper is recognized as one of the best algaecide killers known to man. Oxides and sulfates of copper are used for pesticides, algaecides and fungicides. Pool stores worldwide sell copper based algaecide to kill black algae - the toughest of all to kill. The greatest benefit of copper/silver ionization is that the ions remain in the water providing a long-term residual protection. They provide long-term, nontoxic purification and prevent against recontamination. Unlike most other types of sanitizers, the copper and silver ions remain in the water until they flocculate, or form masses with algae and bacteria and then become large enough to be removed by the filtering equipment. 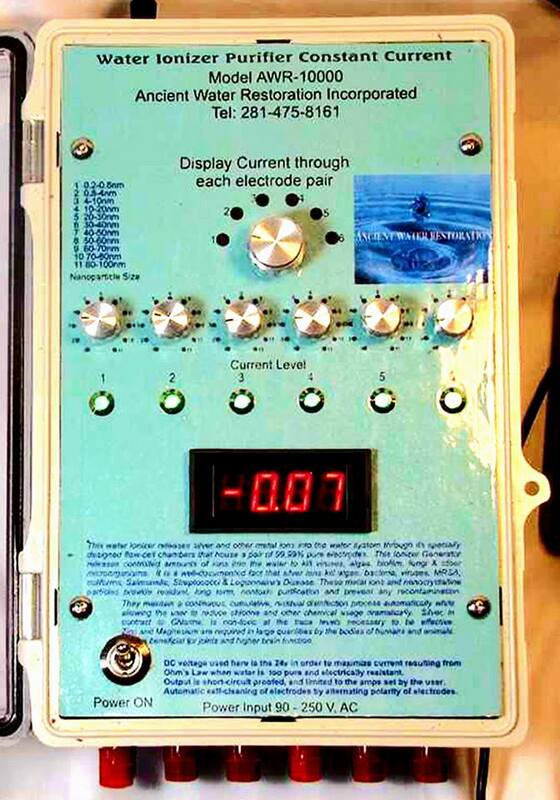 When the "used" copper and silver ions are removed, the microprocessor control box is always producing new copper and silver ions to continuously sanitize the water. Generally the setting of the microprocessor is kept at the same setting, thus a proper amount of copper and silver ions are always in the water. If your test kit shows a copper-ion level too low, simply turn the control knob up a notch. The digital display will show the milliamp charge going to the electrodes. Even if the unit was turned off, the copper and silver ions remain in the water until they flocculate with algae and bacteria, and are removed by the filtering system. Sometimes this can last several months! Marine Habitat Systems & Swimming Pools: The AWR Water Purifier Series employs ionization to purify water bodies similar to the Marine Science Center dolphin/turtle pools systems for bacteria/algae control. Because high levels of chlorine cause damage to the skins of dolphins and turtles, the Marine Science Center employs a chlorine-free system of water purification. Other applications are in Aquaculture and Pisciculture for culture of food marine animals like shrimp, salmon, prawns.